STURGIS -- David M. Henshaw, 57, died at 3:07 p.m. Wednesday, Jan. 7, 2004, at his home here. Survivors include his wife, Kay Henshaw; one daughter, Debbie James of Owensboro; two sons, Bobby Henshaw and George Henshaw, both of Sturgis; his parents, George C. and Evelyn Henshaw of Sturgis; four sisters, Mary Lou Duncan, Ida Jo Dayberry, Rebecca Greenwell and Kate Winders, all of Morganfield; one brother, William "Boo" Henshaw of Venice, Fla.; and six grandchildren. Services will be at 10 a.m. Saturday at St. Agnes Catholic Church in Uniontown. The Rev. Terry Devine will officiate. Burial will be in St. Ambrose Cemetery in Union County. Friends may call from 2 to 8 p.m. Friday and until service time Saturday at Whitsell Funeral Home in Morganfield. Expressions of sympathy may take the form of contributions to Dad's Outdoor Adventures, c/o United Community Bank in Morganfield and Sturgis. David M. Henshaw, 57, of Sturgis, died at 3:07 p.m., Wednesday, January 7, 2004 at his residence. Mr. Henshaw was preceded in death by one sister Judy Holt. Survivors include his wife Kay; his parents, George C. and Evelyn Henshaw of Sturgis; one daughter, Debbie James of Owensboro; two sons, Bobby and George Henshaw, both of Sturgis; four sisters, Mary Lou Duncan, Ida Jo Dayberry, Rebecca Greenwell and Kate Winders, all of Morganfield; one brother William "Boo" Henshaw of Venice, Fla.; and six grandchildren. Funeral services were held Saturday, January 10, at St. Agnes Catholic Church in Uniontown with Father Terry Devine officiating. Burial was in the St. Ambrose Cemetery in Union County. Memorial contributions may be made to Dad's Outdoor Adventures, in care of the United Community Bank. Services for David M. Henshaw, 57, Sturgis, who died Wednesday, will be at 10 a.m. Saturday at St. Agnes Catholic Church in Uniontown. The Rev. Terry Devine will officiate. Burial will be in St. Ambrose Cemetery in Union County. Friends may call from 2 to 8 p.m. today and until service time Saturday at Whitsell Funeral Home in Morganfield. Services for David M. Henshaw, 57, Sturgis, who died Wednesday, will be at 10 a.m. today at St. Agnes Catholic Church in Uniontown. The Rev. Terry Devine will officiate. Burial will be in St. Ambrose Cemetery in Union County. Friends may call until service time today at Whitsell Funeral Home in Morganfield. Obituary of David Michael Henshaw. 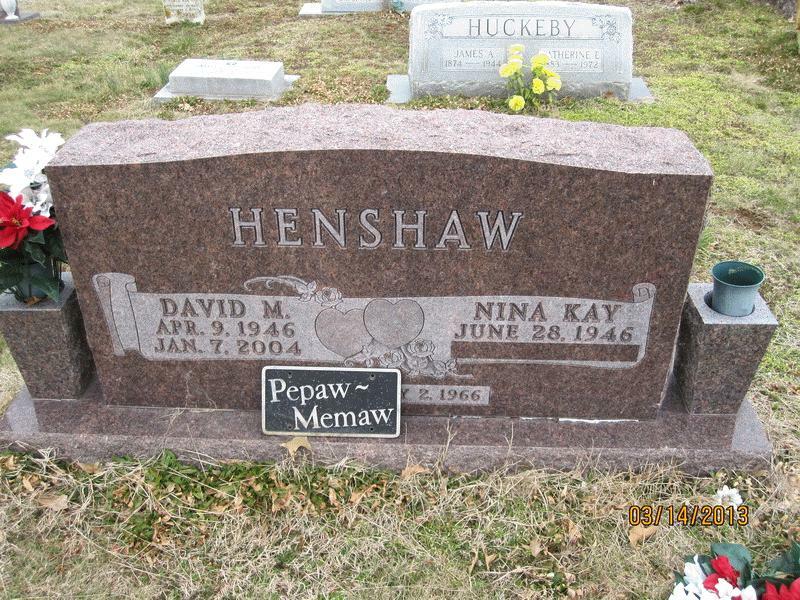 Obituary of David M. Henshaw; the "Union County Advocate", Jan 8 2004: http://www.ancestry.com. Obituary of Judy Henshaw Holt, "The Sturgis News", Sep 13 1999. Obituary of David M. Henshaw; the "Courier-Press", Jan 9 2004: http://www.ancestry.com. Funeral notice for David M. Henshaw; the "Union County Advocate", Jan 9 2004: http://www.ancestry.com. Funeral notice for David M. Henshaw; the "Union County Advocate", Jan 10 2004: http://www.ancestry.com.